I recently attended one of the Playing Mantis workshops held by Burgert. The concept of improvisation being applied as a tool for learning was totally new to me and I was very curious to see what it was all about. The workshop was a great success in my opinion. A fresh approach to the practice of personal and team development: Joyful and exciting, but at the same time instructive. The exercises were simple in their execution, yet led directly to reflections and revealed some rather surprising insights. As a psychologist I believed that I already knew quite a bit about some of the topics and ideas touched upon by the workshop. Amazingly, afterwards I found myself continuously reflecting on these exercises and the new thoughts they brought up, even to this day. This led me to ponder some questions with regards to the underlying neuropsychological processes of learning. What happens in our brain that makes us learn so easily in an improvisational setting and why does it bring about such an outstanding effect? To understand this, I would like to shortly outline some facts about learning as well as some of the findings of current research. If we talk about learning, we usually refer to the act, process or experience of gaining knowledge or skill. Psychologists often define it as acquiring of modifying patterns of behaviour or cognition, usually after practicing or experiencing something. Firstly, we need to know that our brains will experience lifelong physical diversification and development as a result of learning. A human brain contains about 120 billion neurons (nerve cells) that are interconnected three-dimensionally. One neuron can have a few thousand connections, which means that we command a dense network with a fibre length of about 400 000 kilometers. Every piece of information reaching our brain will be transformed and decoded into electronic patterns. Neurons pass this information to other neurons, to muscles or to gland cells. This information transfer can be optimized through an expansion and modification of the existing network: Learning materializes through changes at the synaptic clefts between neurons or through the creation of new neural conjunctions. At the same time, every process of learning provides a basis for the continuation of learning in the future. In other words, every new connection becomes a stepping stone for further development beyond what has just been learned. The opposite effect takes place as well: Connections which are not being used anymore become degraded. This is for example what happens when we “forget”, which means, we lose access to the knowledge that was saved in the brain. Learning therefore shapes the individual micro-structures of our brains, neuro-scientists call this “plasticity”. These above mentioned learning processes take place throughout our whole lives, and the brain changes according to its usage. The question then to raise here is: How can we optimize these processes? What can neuroscience tell us about optimal learning and where do improvisational learning techniques fit into these findings? One of the most significant memories of the improvisation workshop for me, is that it was a lot of fun. Even if Burgert’s description of the upcoming tasks may have sounded weird at first, I got the impression that everybody enjoyed them once they began, leading to many smiles and laughter in the group. What does this tell us about their effects? Emotions play an essential role in learning and neuroscience helps us to understand why this is the case: There are some areas in the brain which are particularly involved in learning and memory. This is the so called “Limbic System”, which consists of the Hippocampus and the Amygdala in the medial temporal lobes, the basal fore brain as well as the prefrontal cortex and areas of the brain stem. These structures serve as a kind of operational centre: The Limbic System executes the emotional evaluation and selection of incoming information. It can be seen as a filter, which any information has to pass before it can be further processed and encoded. Emotionally coloured contents, which are perceived as relevant and important to ourselves, pass this filter more easily and will receive preferential treatment during further processing in the brain. This means that they will be encoded more quickly, firmly and deeply. The ability to remember is in the same way strongly dependent on the emotional content of the learning material, as well as on the personal concern, mood and involvement during the learning process. Emotions are of great importance for learning processes because they allow the personal identification with everything that has to be learned. If we therefore manage to combine a learning experience with positive emotions by means of making it enjoyable, we can be sure that its content will be memorized for a long time. This means that the playfulness that Playing Mantis incorporate into their improvisation techniques, strongly increases their effectiveness. 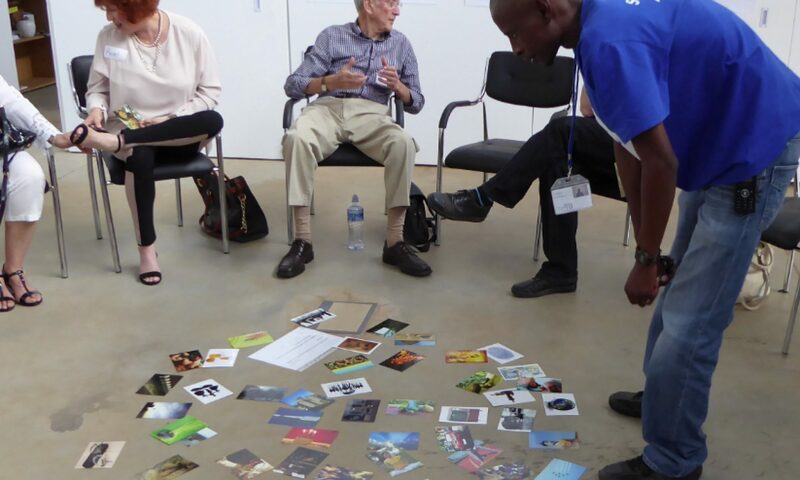 The exercises we did in the workshop contained guidelines, but often demanded from the participants to develop ideas, movements and stories for themselves. There was never a sheet of paper or model we were supposed to comprehend and memorize, and the outcome was open to our personal explanation and interpretation. This kind of framework leads to creative learning. Human creativity is a specific kind of thinking or cognitive process, because it involves making new mental connections rather than analyzing or commenting on existing ones. On the neural level, this commensurates with the build up of novel neural pathways or the reconnection of previously disconnected ones. An FMRI-study, conducted at a university in Bristol in 2005 by Paul Howard-Jones and colleagues, aimed to identify those areas of the brain associated with making up a story creatively. Tasks involving story telling will usually result in increased activity in the left side of the brain, which is associated with language processing. This study however, found that those participants who solved the task creatively, showed an increase in activity in certain prefrontal areas of both hemispheres of the brain. These results suggest that parts of the right hemisphere are required for creative thinking. An explanation for this, is that creative thinking demands higher cognitive effort: We have to access different areas in the brain and combine the relevant information into a new, creative solution. The additional effort required might have been needed to access contextual memory that was necessary to learn a new insight. This memory might have become inaccessible and eventually even forgotten otherwise. Self-derived, creative solutions therefore generate a type of learning which manifests across the brain and is thus more successful, while being told what to do merely generates temporary, superficial knowledge. Additionally, it has been shown that the kind of “Aha! experiences” we get through our own efforts, also activate the brain’s reward system and thus improve learning as explained in the last chapter about emotions. If we talk about the attainment of “knowledge”, we do not only think about cognitive structures, but also include behavioral patterns, which contain diverse impressions. The concepts and behaviours that participants of these workshops are supposed to gain, should also be applicable in complex and dynamic real-life situations. Our brain doesn’t have direct access to the world in order to gain knowledge. Sensory cells will transform every incoming piece of information into signal patterns which will then be distributed to different brain centers, according to their qualities. For example, impressions concerning movement will be processed in other areas than input about the properties of materials or sounds and language. These signals turn into information and obtain meaning only through their concurrent processing in these different brain regions. In the same way, knowledge is not being stored and retained as a whole. When we memorize something, our brain uses particularly notable pieces of information, which are then recombined into one impression. Therefore, the most successful learning methods are those that cultivate the ability of the brain to link and build networks. Ideally they should stimulate all the senses and activate multimodal skills to thus challenge the brain in different aspects and vice versa enable it to activate the attained knowledge through various triggers. Multi-faceted activities advance the development of the brain throughout a person’s lifetime. Therefore it is playful activities, not passive, uninvolved parroting of knowledge that leads to physical changes of the brain and hence to enduring, applicable learning. In a nutshell, improvisation can be seen as a distinct type of dynamic, experiential learning, which promotes creative problem solving and innovation through processes that correspond with the operating principles of our brain. Howard-Jones, P.A., Blakemore, S.-J., Samuel, E. A., Summers, I. R., Claxton, G. (2005). Semantic divergence and creative story generation: An fMRI investigation. Cognitive Brain Research, 25, 240 – 250.